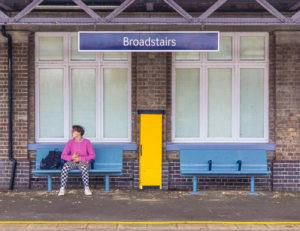 Broadstairs is five or six minutes from Margate by train, an hour and five minute walk by road or a just over two hour stroll along the coastal path. In other words not far at all physically. But it seems a world away socially and economically. The High Street is well-maintained, the shops are occupied, they offer choice and they look prosperous, so unlike the case study in decline that is Margate. Houses have an air of homes occupied by people who care and holiday flats are advertised with pride. Broadstairs harbour is a good timber example of its kind; the Promenade and Victoria Parade, overlooking the pretty bay, embody gentle 19th century elegance; Morelli’s ice-cream parlour is a joyful Art Deco survivor; and the town treasures its Dickins connections. There is little of the seaside tackiness of Margate, nor the misconceived and misplaced redevelopment. Broadstairs was able to stand in for Margate in Mike Leigh’s film Mr Turner. The one obvious blot is the derelict funicular railway built in 1910 by Messrs R Waygood and Co – a restoration in 1991 was undone almost immediately by a storm. 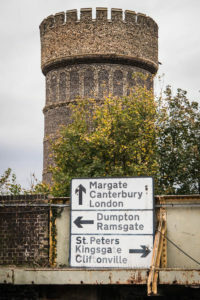 The Crampton Tower, which welcomes visitors by train and road, is a robust survivor. Grade II listed the citation states: ‘A water tower dated 1859. A circular tower, 3 storeys high faced with flint and having rough flint dressings and stringcourses. Crenellated parapet. Brick moulded cornice and band of blank arcading picked out in rough flints with blank panels of knapped flint between. 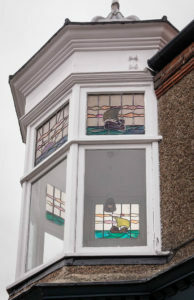 Round-headed windows.’ It was designed by Thomas Russel Crampton, who is now remembered, if at all, as a designer of locomotives and of railways, The tower houses a museum, including ‘7 working model railways in gauges N,OO,O and Gauge One’. Dreamland does indeed seem a world away. This entry was posted in Street Photography, Travels. Bookmark the permalink.